Stunning Mid-Century Modern rounded mirror with oval form. Wrapped in red and black snakeskin print embossed leather. Leather over hand carved wood with half round molded frame. In the style of Karl Springer. Mid-Century Modern round mirror wrapped in stunning embossed leather with snakeskin design. Python print leather with lacquered ebonized wood pediment top. Mid-Century Modern Italian bamboo wall mirror, 1970s. 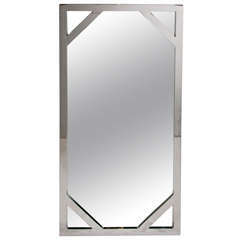 Mid-Century Modern Italian stainless steel framed floating mirror, 1970s. Mid-Century Modern Italian faux bamboo brass wall mirror, 1970s The Mirror is in very good vintage conditions. It could be hung both horizontal and vertical. American Mid-Century Modern large round wall mirror mounted in a beveled frame veneered in a small, faux ivory brick design. For your consideration is a fabulous, hanging wall mirror, made of burl wood, by La Barge, circa 1970s. In excellent condition. The dimensions are 36" (3') Sq x 1.5" D.
Oval Italian rattan wall mirror Italy, 1970s, Mid-Century Modern.